Оборудование для систем центрального отопления BIO-CK P Unit (номинальная тепловая мощность от 25 до 100 кВт) предназначен для сжигания древесной щепы. Он состоит из водогрейного котла BIO-CK P, горелки с транспортером топлива и цифрового управления котлом. В блок BIO-CK P необходимо добавить топливный бункер с транспортером и пружинным узлом выемки топлива. Это оборудование предназначено для небольших и средних помещений, как основной или резервный источник тепла. Котлы BIO-CK P Unit отличаются успешным сочетанием современных технологий и качественных материалов, а также простотой установки и использования. Проверенные технические решения делают данные котлы безопасными и надежными в эксплуатации. BIO-CK P Unit изготавливаются в соответствии со стандартами EN 303-5 и ISO 9001; ISO 14001. A successful blend of modern technology and high quality construction materials with easy installation and use. Keeping the combustion gases in the three passages ensures a high degree of boiler utilization, making it “economical”. The fan and electric heater located in the burner, driven by regulation, automatically burn off fuel and maintain flame. Delivered in parts that allows easy transportation and installation and reduces the risk of damage. 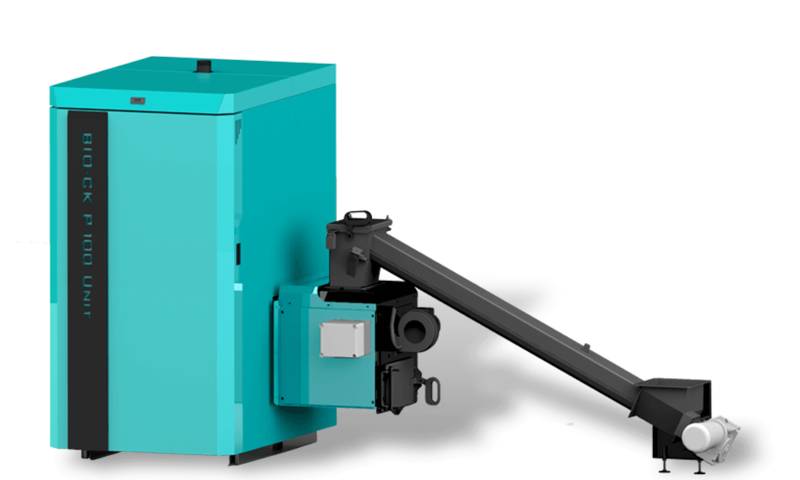 Central heating equipment designed for wood chips and wood shavings burning sized P16A-P45A (G30-G50) and with nominal heat output from 25 to 100 kW. Maximum permitted fuel moisture content is 35% (M35). A fuel tank with a transporter and mixer should be added to the BIO-CK P Unit. 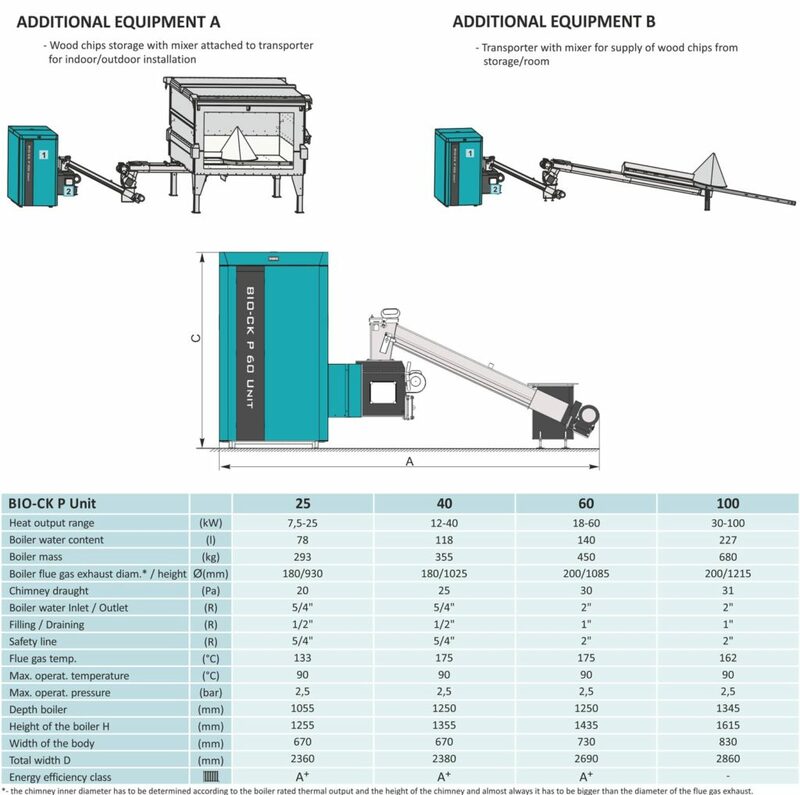 Available as additional equipment is woodchips storage to be installed indoors or outdoors as well as a wood chips mixer with a transporter to be installed inside into existing storage/room. Optionally the boiler can be ordered with burner mounted on left or right side. The fan and electrical heater positioned in the burner, operated by the controller, ignite automatically and maintain the flame. A carefully sized combustion chamber with triple pass flue gas flow assure boiler operation at high efficiency. This makes the boiler very economical in use. The combustion chamber is made out of a high quality sheet metal (5 mm thickness). Thermal safety system can be connected in through pre-prepared apertures. The body of the boiler is delivered separately from the casing with thermal insulation, the burner with fuel feeder and the boiler digital controller which enables easier transportation and assembly with minimum risk. Basic boiler delivery includes a thermometer and cleaning set. Required power supplies: 380/400 V.
BIO-CK P Unit can be installed directly to heating system or through accumulation tank (CAS) with a minimum volume of 12 l/kW and 3-way thermal valve on 60°C. Option of additional installation of flue gas extraction fan to boiler’s flue gas exhaust.